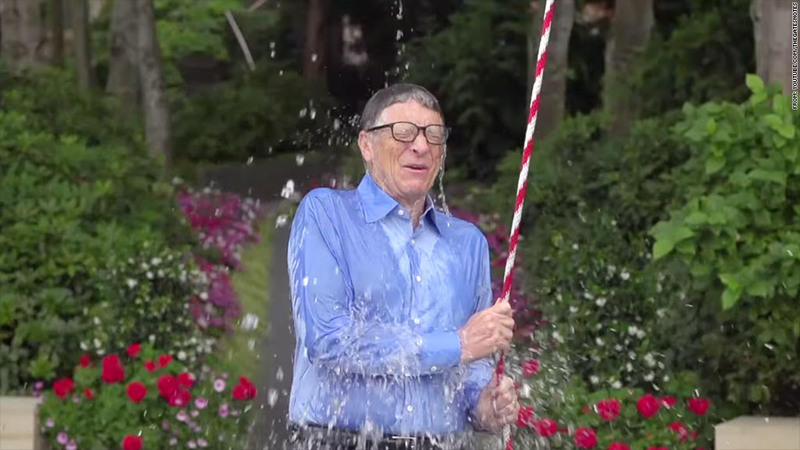 The ALS Association says Ice Bucket Challenge videos, such as this one from Bill Gates, have raised $15.6 million for Lou Gehrig's disease. Maybe you're getting a little tired of seeing your Facebook feed flooded with people pouring water on their heads. But the Ice Bucket Challenge for ALS, or Lou Gehrig's disease, is more than just another chance for folks to flaunt themselves on social media. The ALS Association said Monday that it has received $15.6 million in donations since July 29. That's up from $1.8 million raised during the same time period last year. The challenge is simple. Participants dump a bucket of ice-cold water over their heads and post the video to social media, challenging three others to either do the same within 24 hours or make a donation to the ALS Association. Many participants, which have included some of the top names in the sports, entertainment, business and political world, have said they're doing both. Some critics have knocked the viral trend as yet another example of "slacktivism," the derisive nickname for efforts in which people support a cause on the Internet, but don't do anything to actually help. But the numbers don't bear that out in this case. The ALS Assocation said that 307,598 of the donations it has received in recent weeks have come from people who had never given before. "Without a doubt, the popularity of the Ice Bucket Challenge, the social media phenomenon that continues to sweep the nation, has encouraged tens of thousands of Americans not only to douse themselves with ice water but also to open their pocketbooks and to donate to the fight against ALS," Barbara J. Newhouse, the president and CEO of the association, said in a message posted to the group's website on Saturday. It hasn't hurt that people with massive public profiles, and deep pockets, have been among those to go under the ice. Facebook (FB) CEO Mark Zuckerberg challenged Microsoft (MSFT) founder Bill Gates, who responded with a funny video in which he designs an elaborate structure to douse himself. Hen then challenged SpaceX and Tesla Motors (TSLA) boss Elon Musk, Ryan Seacrest and Chris Anderson of TED (All three accepted). Oprah Winfrey answered multiple challenges by taking (or, rather, receiving) the plunge, with best buddy Gayle King, of course, doing the honors. NBA superstar Lebron James, tennis champ Caroline Wozniacki and NFL commissioner Roger Goodell are just a few of the most recent athletes to ice-bucket. The trend took off in a big way in the sports world, after being kicked off by Pete Frates, a former baseball player at Boston College who has been living with ALS since 2012. He floated the idea and his former teammates, as well as other Boston-area athletes, took him up on it. It was noticed and covered by local media and that attention, along with the social Web's viral nature, launched it onto a much larger stage. Newhouse said the ALS Association will be using the funds to help families dealing with the disease as well as invest in helping find a cure. Currently, the group supports 98 active research projects and recently announced $3.5 million in funding for 21 new ones. "Never before have we been in a better position to fuel our fight against this disease," she said in her post. "Increased awareness and unprecedented financial support will enable us to think outside the box."